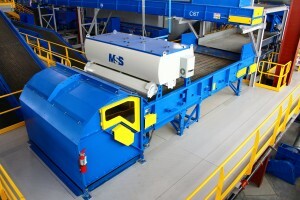 MSS Inc., a world leading manufacturer of optical sorting equipment, recently achieved the highest average sorting performance against five competitors, in an independent study. The results of this study were presented at the APR Technical Forum in New Orleans, Louisiana on February 1st, 2016. The test was intended to determine whether a new type of polyolefin-based shrink label for PET bottles, manufactured by UPM Raflatac, could be commercialized in the current PET market with the existing infrastructure. The test also determined whether the labels could be properly separated both by resin and color. This testing was facilitated and performed by Plastics Forming Enterprises, LLC, an independent full service testing and R&D company serving the plastics, packaging, recycling and consumer products industries. The evaluation was carried out at the testing centers of six optical sorter manufacturers. The testing involved several trial runs of sample bottles, as well as other runs of sample bottles mixed in with random PET and Non-PET plastic bottles. 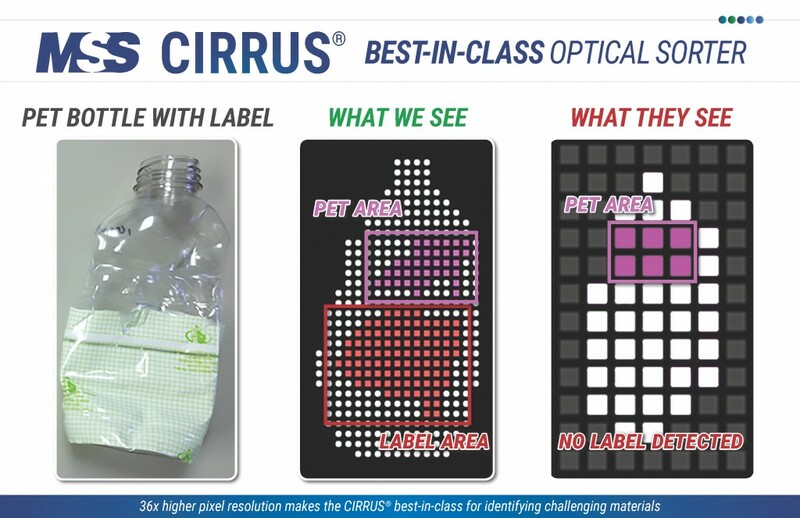 The testing focused on the identification of PET bottles of various colors (substrate) behind the partially or fully sleeved label of various colors, and whether they could be positively or negatively sorted as separate categories. 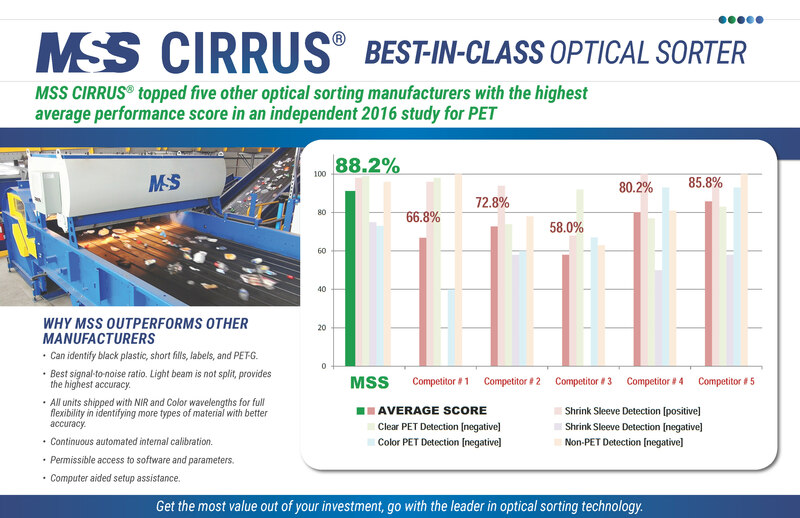 The MSS CIRRUS achieved the highest average test score (88.2%) amongst the six optical sorter manufacturers, as shown in the bargraph below. The full report and public presentation of the results in PDF format are available from MSS upon request.